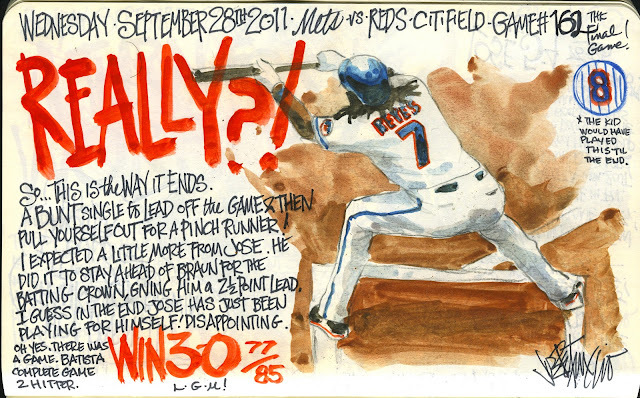 My Mets Journal: So this is how it ends Jose? Thanks for your sketches all year, Joe! I hope you plan on continuing next year. Also, have you considered publishing this as a comprehensive book? "Dear God this is embarrassing.....PLEASE DO RESEARCH ON BASEBALL HISTORY. Tony Gwynn, Bernie Williams, Tim Raines, George Brett, Wade Boggs, Bill Madlock, Willie Wilson, Bill Mueller, Terry Pendleton, Ken Griffey Sr, etc, etc, ALL DID THE EXACT SAME THING THAT REYES DID YESTERDAY. So if you idiots wanna kill Jose and say he has no "heart" and is a "me" player.....then say the SAME thing about all of those guys. Facts people....FACTS." First off....I DON"T HATE JOSE!!!! It isn't so much about the batting title. If this was Jose's last game as a Met he owed it to the fans to play it to the end! The players above all didn't do the "same thing". George Brett was winning a batting title hitting about.390 in 1980 with no one within 40 points of him. If he simply rested on the last day before the playoffs.And Tony Gwynn did the same thing. He was always 10 to 15 points ahead of everyone else. I guess I just grew up in a time when people really played for the love of the game. Ted Williams, in his chase for .400, was hitting .3996 on the last day of the season. His manager wanted to sit him out so he would be rounded up to .400. Williams refused, went out that day and had a three hit game to up his average to .406. That's TED WILLIAMS. THE GREATEST HITTER OF ALL TIME. Since when did we start comparing modern day player to TED WILLIAMS. That is schlock! Jose was trying to give the franchise it's FIRST EVER BATTING TITLE and what happens? His fanbase SHITS ON HIM. I wouldn't be surprised if he signs elsewhere. I hate the NY media and I hate the NY Mets fanbase. This is absolute garbage. I don't think you are getting what I'm saying! I'm proud of Jose. 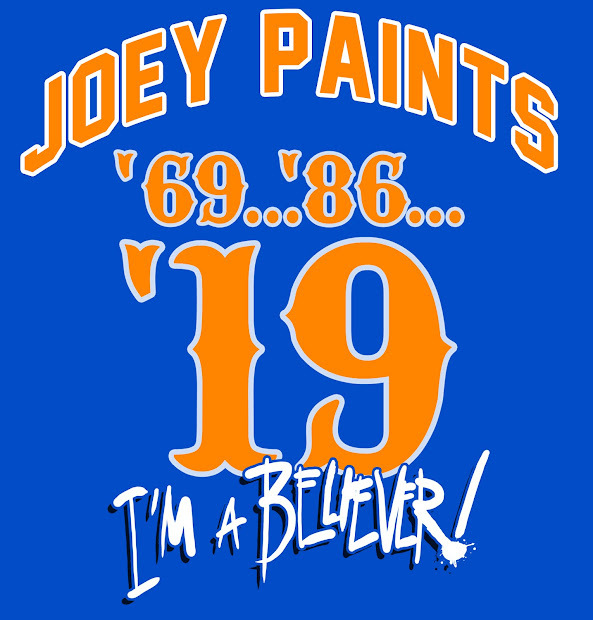 I just think he should have played the game.Especially if it was going to be his last as a Met. And maybe modern day players should compare themselves to players like Williams. That is when it was a game. Ted actually went 6-8 in a doubleheader on the last day. As for Jose, I'm not sure about some of the players above, but Bernie Williams basically did what Jose did in 1998. He got two hits, felt comfortable with his lead over Mo Vaughn, and sat down. And of course we hear Yankee fans demeaning Reyes but not uttering a peep about their sainted Bernie Baseball. Nothing against Bernie, he was/is a class act, but people forget what they want to forget. As for sitting out a game to preserve a title, Willie Wilson definitely did it in 1982. And Ty Cobb definitely did it in 1910 when he sat out the last two games. That story is very interesting if you care to look it up. I think Ted's story is apples and oranges because he wasn't going for a batting title. He wanted .400, not .3996. And he achieved that in Game 1 of the doubleheader, going 4-5 and putting himself at .404. And to his credit, he played the second game and went 2-3, giving him .406. He was a legendary ballplayer for a reason. And who knows what he would have done had he not fought in WWII. Still, that was a different era when hitting .400 hadn't yet become the legend it has. Cobb and Hornsby had done it three times each. The last time Cobb did it was 1922 and Hornsby 1925. And Bill Terry of the Giants had hit .401 in 1930. So in the public mindset back then, it wasn't such a holy grail (to his credit again, Ted made it one). But we also can't forget that every .400 hitter played in a segregated era. Anyway, you could debate this stuff until Mettle the Mule comes home, but my final thought is that I'm not that upset about what Jose did. But it could have done it in a far classier way. Run the bases at least.